Lexington is a town in Middlesex County, Massachusetts, United States. On the 25th (Sat), take an in-depth tour of Buckman Tavern, see the interesting displays at Peabody Essex Museum, and then explore the galleries of The House of the Seven Gables. Get ready for a full day of sightseeing on the next day: take in the waterfront activity at Pickering Wharf, then witness the site of a historic battle at Minute Man National Historical Park, and then admire the majestic nature at Walden Pond State Reservation. To see ratings, maps, and other tourist information, refer to the Lexington planning app . Winnipeg, Canada to Lexington is an approximately 9.5-hour flight. You can also drive. You'll lose 1 hour traveling from Winnipeg to Lexington due to the time zone difference. In May in Lexington, expect temperatures between 24°C during the day and 9°C at night. Wrap up your sightseeing by early afternoon on the 27th (Mon) to allow enough time to travel to Woodstock. Woodstock is the shire town of Windsor County, Vermont, United States. On the 28th (Tue), you'll have a packed day of sightseeing: hit the slopes at Killington Resort and then explore the stunning scenery at Quechee Gorge. To see reviews, traveler tips, maps, and more tourist information, go to the Woodstock day trip tool . You can drive from Lexington to Woodstock in 2.5 hours. May in Woodstock sees daily highs of 24°C and lows of 8°C at night. Wrap up your sightseeing on the 29th (Wed) to allow time to drive to Burlington. Burlington is the most populous city in the U.S. Kick off your visit on the 30th (Thu): trek along Stowe Recreation Path, then examine the collection at Shelburne Museum, and then contemplate the long history of Shelburne Farms. Get ready for a full day of sightseeing on the next day: hike along Burlington Bike Path, kick back and relax at North Beach Park, then tour the pleasant surroundings at White's Beach, and finally see human ingenuity at work at Alice Falls. To see ratings, more things to do, other places to visit, and more tourist information, read Burlington travel planner . Traveling by car from Woodstock to Burlington takes 2 hours. Alternatively, you can take a bus; or take a train. Expect a daytime high around 25°C in May, and nighttime lows around 11°C. Finish your sightseeing early on the 31st (Fri) so you can drive to Lincoln. Stretching through the White Mountain National Forest, Lincoln welcomes hikers along the Appalachian Trail. Kick off your visit on the 1st (Sat): take in the dramatic natural features at Flume Gorge, then explore the striking landscape at The Basin at Franconia Notch State Park, and then whizz through the canopy at some of the top local zipline courses and adventure parks. For traveler tips, where to stay, other places to visit, and other tourist information, go to the Lincoln online driving holiday planner . You can drive from Burlington to Lincoln in 2.5 hours. Alternatively, you can do a combination of bus and car; or take a bus. Plan for little chillier nights when traveling from Burlington in May since evenings lows in Lincoln dip to 7°C. Finish your sightseeing early on the 1st (Sat) to allow enough time to drive to North Conway. On the 2nd (Sun), take in the dramatic scenery at Diana's Baths, then view the masterpieces at Jackson Art Studio & Gallery, then admire all the interesting features of Mt Washington Auto Rd, and finally pause for some serene contemplation at The Little White Church. Get ready for a full day of sightseeing on the 3rd (Mon): look and learn at Mount Washington Observatory Weather Discovery Center, then take in the dramatic natural features at Cathedral Ledge, and then take a memorable drive along Kancamagus Highway. To find other places to visit, reviews, more things to do, and other tourist information, read North Conway road trip tool . Drive from Lincoln to North Conway in 1.5 hours. Alternatively, you can take a bus. Plan for somewhat warmer nights when traveling from Lincoln in June since evenings lows in North Conway dip to 17°C. Finish up your sightseeing early on the 3rd (Mon) so you can go by car to Bar Harbor. Bar Harbor is a town on Mount Desert Island in Hancock County, Maine, United States. On the 4th (Tue), explore the wealth of natural beauty at Acadia National Park. On the 5th (Wed), you'll have a packed day of sightseeing: visit a coastal fixture at Bass Harbor Head Lighthouse, then examine the collection at The Seal Cove Auto Museum, then take in the spiritual surroundings of St. Saviour's Church :, and finally stroll through Sand Beach. For maps, ratings, and more tourist information, use the Bar Harbor online trip itinerary maker . You can drive from North Conway to Bar Harbor in 4.5 hours. Alternatively, you can do a combination of bus and flight; or do a combination of car and bus. Expect slightly colder temperatures when traveling from North Conway in June; daily highs in Bar Harbor reach 23°C and lows reach 13°C. Wrap up your sightseeing on the 5th (Wed) early enough to drive to Portland. Visit Popham Beach State Park and Old Orchard Beach for some beach relaxation. Let the collections at Portland Head Light and Maine Maritime Museum capture your imagination. Explore Portland's surroundings by going to Coastal Maine Botanical Gardens (in Boothbay) and Pemaquid Point Lighthouse (in Bristol). There's more to do: admire the masterpieces at Portland Museum of Art and learn about winemaking at Maine Mead Works. For traveler tips, reviews, ratings, and other tourist information, refer to the Portland road trip app . Traveling by car from Bar Harbor to Portland takes 3.5 hours. Alternatively, you can take a bus; or do a combination of flight and bus. In June, daily temperatures in Portland can reach 26°C, while at night they dip to 14°C. Wrap up your sightseeing on the 8th (Sat) early enough to drive to Kennebunkport. Kennebunkport is a town in York County, Maine, United States. Start off your visit on the 9th (Sun): contemplate the long history of Strawbery Banke Museum, take in the exciting artwork at Abacus, then take in the dramatic natural features at Perkins Cove, and finally appreciate the extensive heritage of Marginal Way Walkway. Get ready for a full day of sightseeing on the 10th (Mon): stop by Scalawags Pet Boutique, then explore the world behind art at Ogunquit Museum of American Art, and then tour the pleasant surroundings at Ogunquit Beach. To find maps, reviews, more things to do, and other tourist information, refer to the Kennebunkport trip planner . Traveling by car from Portland to Kennebunkport takes an hour. Alternatively, you can take a bus; or do a combination of train and bus. June in Kennebunkport sees daily highs of 28°C and lows of 13°C at night. Cap off your sightseeing on the 10th (Mon) early enough to travel to Oak Bluffs. Oak Bluffs is a town located on the island of Martha's Vineyard in Dukes County, Massachusetts, United States. On the 11th (Tue), explore the striking landscape at Aquinnah Cliffs, enjoy the sand and surf at Katama Beach/ South Beach, then get advice or help at Martha's Vineyard Historical Society, and finally take a stroll through Martha's Vineyard Camp meeting Association (MVCMA). Here are some ideas for day two: visit a coastal fixture at Gay Head Lighthouse, kick back and relax at Menemsha Public Beach, don't miss a visit to The Granary Gallery, then enjoy the sea views from Edgartown Lighthouse, and finally see the interesting displays at Cottage Museum. To find other places to visit, where to stay, photos, and more tourist information, you can read our Oak Bluffs trip planner. Do a combination of car and ferry from Kennebunkport to Oak Bluffs in 4 hours. Alternatively, you can do a combination of bus and flight; or do a combination of bus and ferry. Expect a daytime high around 26°C in June, and nighttime lows around 14°C. Finish your sightseeing early on the 12th (Wed) so you can travel to Newport. On the 13th (Thu), look for gifts at Thames Glass, take a memorable drive along Ocean Drive Historic District, then see the interesting displays at The Breakers, and finally get to know the fascinating history of Cliff Walk. Get ready for a full day of sightseeing on the 14th (Fri): admire the striking features of The Elms, enjoy the sand and surf at Sachuest Beach (Second Beach), and then enjoy the sand and surf at Narragansett Beach. For reviews, other places to visit, photos, and more tourist information, read Newport driving holiday planner . Do a combination of ferry and taxi from Oak Bluffs to Newport in 2.5 hours. Alternatively, you can do a combination of ferry and car; or do a combination of ferry and bus. Expect a daytime high around 26°C in June, and nighttime lows around 17°C. Wrap up your sightseeing on the 14th (Fri) to allow time to drive to Mystic. A historical leading seaport, Mystic has maintained a strong respect for the past. 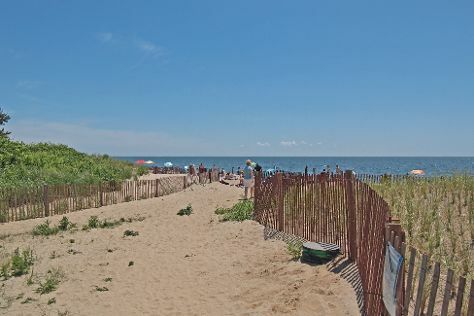 On the 15th (Sat), enjoy the sand and surf at Misquamicut State Beach, then contemplate the long history of Olde Mistick Village, then see the interesting displays at The Submarine Force Museum, and finally snap pictures at Mystic River Bascule Bridge. To find reviews, more things to do, and tourist information, you can read our Mystic tour itinerary builder . Getting from Newport to Mystic by car takes about 1.5 hours. Other options: do a combination of bus and train. In June, plan for daily highs up to 27°C, and evening lows to 17°C. Cap off your sightseeing on the 15th (Sat) early enough to go by car to New Haven. New Haven, in the U.S. Deepen your sense of the past at sights like Franklin D. Roosevelt Presidential Library and Museum and The Mark Twain House & Museum. Get in touch with nature at Hammonasset Beach State Park and Croton Gorge Park. Explore New Haven's surroundings by going to The Shoreline Greenway Trail (in Madison) and Minnewaska State Park Preserve (in Kerhonkson). Next up on the itinerary: admire the masterpieces at Yale University Art Gallery and admire the majestic nature at Sleeping Giant State Park. To find where to stay, reviews, other places to visit, and other tourist information, read our New Haven trip planner. Traveling by car from Mystic to New Haven takes 1.5 hours. Alternatively, you can take a train; or take a bus. June in New Haven sees daily highs of 28°C and lows of 18°C at night. Wrap up your sightseeing by early afternoon on the 19th (Wed) to allow enough time to travel back home.